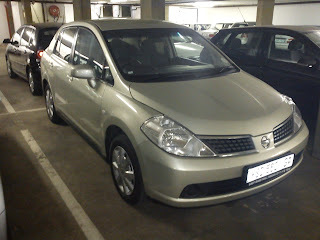 I drove a 2009 Nissan Tiida recently, it was Rod's courtesy car when his Auris was at the panel shop. I wasn't expecting much from the ugly looking car. But after driving a few kilometers I started to realise a few things about it. It had all that you need in a car. There was safety... ABS and airbags were standard and from the comfort side it came full house with aircon, power steering, electric windows and mirrors. The Tiida had good power from it's 1.6l engine, which produced 80kw, but it's not a car that you can put through corners easily. It may be due to the thin 14" tyres that it came standard with. Interior space was good. Seats were standard, flat seats, not like those semi-bucket seats you get in most cars of today. Ample boot space, can take a pram and a bit of luggage without a problem. 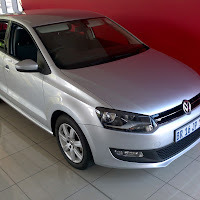 Upon a quick google search I found that you can pick up a 3 year old Tiida with decent milage for around R90k. 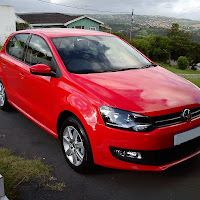 If you are looking for a budget family car that has everything then this ones for you.